The Ixias celebrated their Varsity Shield Cup victory in style on Wednesday, August 20, 2014. The well-deserved celebration was hosted at One on Park Restaurant in honour of the outstanding performance shown by Central University of Technology, Free State (CUT) Rugby team, winning the Varsity Shield Cup three times since 2011. Not only has their victory contributed to sports development at CUT, but has also natured their individual talent so much that some of the current players have recently signed new contracts with some of the national teams. Rugby at CUT also became a breeding ground for legends such as Os du Randt, Daan Human, Gerrie Brits, AJ Venter, André Venter, Pieter and Helgard Muller as well as Jan van Wyk, who also launched their professional careers whilst still studying at CUT (then known as Technikon Free State). Rugby was launched through humble beginnings in 1981 and to date, its endearing success is attributed to the management body, coach, trainers and parents for their undying support in making sure that the team succeeds against all odds. The celebration dinner was indeed a true reflection of the notion that the credit belongs only to those who are actually in the arena, who strive valiantly and know the meaning of great devotions. 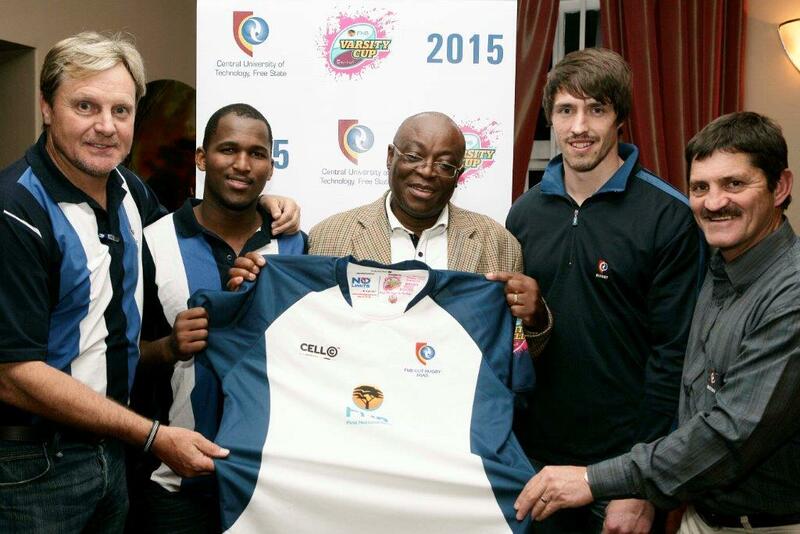 IMAGE: Mr Helgard Muller, Deputy Manager: Operational Sport and no stranger to the world of rugby in South Africa; Kholo Ramashala, Ixias Captain; Dr Paks Tondi, Deputy Registrar: Student Services; Charles Hitchcock; and Coach Bester.